Immigration is a loaded word today. 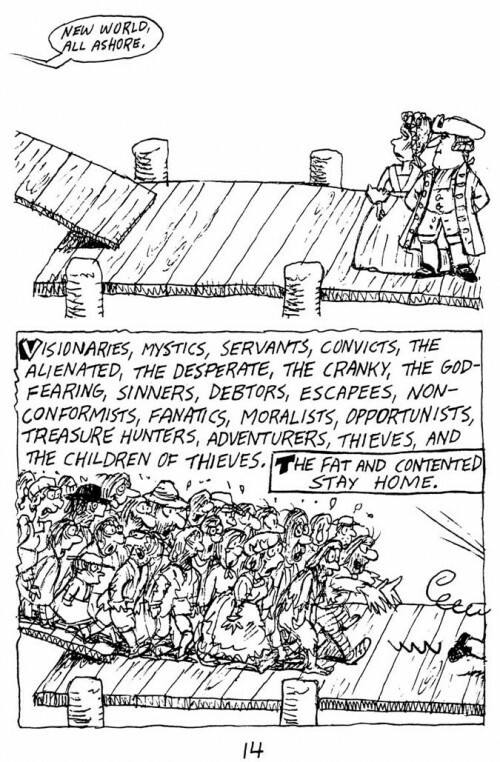 It’s also a topic that plays a central role in “Taxes…” Obviously the early colonists were immigrants. They were seduced, bribed, or suckered into coming to the new world. Some were dragged here in chains, but most staggered ashore with a dream that somewhere in this new land they might find fortune, freedom, and a new start in life. As soon as these newcomers got cleaned up and settled, threw away their old rags and put on new clothes, learned manners and thought of themselves as “the better sort,” they turned to the ships unloading the next arrivals and saw dirty, ignorant, inferior people fit only to be servants and laborers. And so it has gone for every new group that arrives on our shores. Here’s an example from my graphic history, “The Story of the Jews.” It shows Eastern European Jews arriving at the turn of the last century. They’re viewed with embarrassment by the more cultured, educated, and prosperous German Jews who’d arrived looking just as bedraggled 50 years earlier. England encouraged immigration because more workers in the colonies meant more profit for her, but the natural rights of her colonists were irrelevant. Gradually, England’s high-handed and insensitive taxes and regulations would fuel colonial discontent. But first I needed a page that would quickly describe the variety of immigrants who arrived here, and the usual distaste against newcomers by those who were here first. For the rebellion against England to succeed, there would need to be an alliance between rich colonial merchants, who were seeing their profits shrink, and their discontented workers—but that will come a few pages later. Next Next post: How did my Philosophy Comic come about?